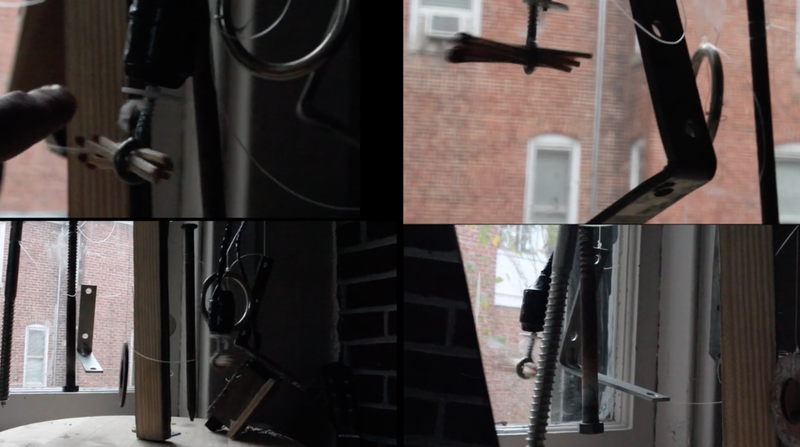 Alicia Grullón moves between performance, video, and photography, channeling her interdisciplinary approach towards critiques on the politics of presence, an argument for the inclusion of disenfranchised communities in political and social spheres. Grullón has participated in residencies in the United States, Korea, and Germany. Her works have been shown at the Bronx Museum of the Arts and El Museo del Barrio, among others. Alicia will be performing "The Rule is Love (Greensboro to present)" a walk from Brooks Hall to the Amphitheater on the 5th and from the end of the downtown mall to the shrouded Lee Statue in Emancipation Park on the 6th. She will be blindfolded and holding a stack of books, and will rely on the assistance of passersby to guide her from start to finish. In order to assist her, passersby will be asked to read aloud a pledge. Annie Temmink is a sculptor and costume designer with international accolades for her work. Her costumes have been featured in the World of Wearable Art (New Zealand), at the Video Music Awards (Los Angeles, CA), on stage for the Crucible (Oakland, CA), and in numerous shows along the east coast. She draws inspiration from a yearlong Watson Fellowship studying textiles and adornment under master craftsmen around the world. This project emphasizes a playful exploration of shape and movement. Beasts and imaginary creatures have often symbolized a collective unconscious, marking moments of community experience around the world. Beasts are a chance for ordinary, evocative magic. Built from cardboard, fabric, and other materials often used daily, this project offers a space to consider their potential for reinvention. The creatures are created in weekly meet-ups to foster community through making and are designed to celebrate playful interaction and connection from those around them. Temmink devised this project in collaboration with local talent: Melissa Goldman, Matt Gordon, Meg Kennell, Carmen Day, and Vaiana Morgan. Avery Lawrence was born and raised in Charlottesville, VA and once played on the Friendship Court soccer team. He attended Chancellor Street Preschool, Charlottesville City Public Schools, the Virginia Governor's School, the University of Pennsylvania, and the California Institute of the Arts. Lawrence currently resides in Philadelphia, PA. He works at The Fabric Workshop and Museum and teaches art at the University of Pennsylvania. He played on the Friendship Court soccer team with Damian, Eric, Litonio, Chris, AB, Kadeem, Logan, Cosby, Main, Carlos, Rico, Willoughby, Ricky, Jeff, Justin, Alex and many others." Avery Lawrence and The Garage invite Charlottesville to gather for a team photo. In the 1990s, Winx Lawrence (Avery's mom) started a youth soccer team that practiced on the Friendship Court playing field in Downtown Charlottesville. Kids from around the city, including Friendship Court residents and Avery, met up twice a week to dribble around cones and scrimmage in preparation for weekend games. At the end of each season, they took a team photo. Join your neighbors on the evening of Friday, April 6 at the Friendship Court field as we recreate that photo and the spirit of team unity with hundreds of Charlottesville residents, get your special edition jersey and be part of the Charlottesville Team Photo. Then stick around, chat with a neighbor and enjoy a free picnic dinner courtesy of The Garage. 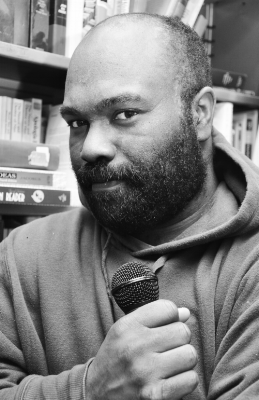 Bernard Hankins is a philosopher, musician, spoken word poet, and creative catalyst. Originally from Chesapeake, VA, he currently lives in Charlottesville where he teaches workshops on creative identity-inspiring others to discover their ultimate purpose. In 2015, Bernard was the Tedx Charlottesville Open Mic winner and Tedx Charlottesville closing speaker. Meaning and Matter: Race and Space is original spoken word poetry by Bernard Hankins, performed at Nau Hall (UVA). This series of poems explores the intersection of humanity, identity, and race through a universe lens. As a society, we are too close to one another, so close that we are unable to see one an/other. Our points of view are myopic, not telescopic. It is the space between that allows for us to see one an/other clearly. We need space, the universe to widen our points of view to see each other as universe-ally-human. Colombian-born/naturalized American citizen, Mayorga has exhibited her work nationally and internationally for the last 18 years. Her work is part of national and international collections and has been reviewed in publications in South America, Europe and the United States. Mayorga lives and works in Washington, D.C. The artist as a pink character adorned with a trailing pink mantle will perform a pigmenting ceremony by slowly walking and offering pink cards to pedestrians walking along the surrounding paths of the old UVA dorms and Charlottesville Downtown Mall. PINKmentation comments on ethnicity, gender and the role that aesthetics and beauty play in popular culture. It also responds to the artist’s obsession with pink, a beautifying agent that provides value, acceptance, and emotional gratification. Through this ceremonial walk, Mayorga will offer an aesthetically pleasing experience that refers to local and national controversial developments regarding issues of gender and ethnicity. Chicho Lorenzo is a self-taught Spanish artist who mixes visual reality with the invisible. He works in a world of constant mutual inspiration with reality and fantasy intertwining to create a language that connects people beyond words. Lorenzo is also an educator and activist, coordinating murals and workshops for adults and children. Tell Me What Matters is an improvised visual concert and an experience in communication. Pedestrians are invited to sit with Lorenzo and share what matters to them. While they speak, Lorenzo illustrates it on a book. Words, ideas and stories dance together on the paper, offering new perspectives. Ed Miller grew up in Charlottesville, VA. He has an MFA from the University of Tennessee, Knoxville. He makes figurative sculpture and has public art on display at several locations throughout Virginia. Ed teaches art classes at PVCC and works at UVA as a studio assistant with Sculpture. The People’s Portrait Project is a sculpture workshop set up on the Downtown Mall that invites people of all ages and walks of life to participate. Participants will have the opportunity to get their portrait made in clay, on the spot. The resulting sculptures will celebrate the diversity and individuality of people on the Downtown Mall. 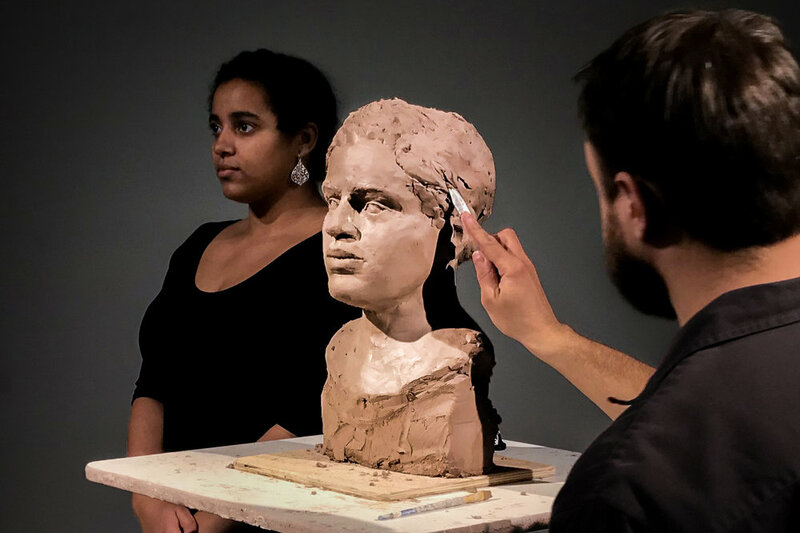 There will also be a clay bust set up for people to work on and transform into their own portrait. This act of creating art will be an inclusive public event. The sculptures created will be displayed in a future exhibition. 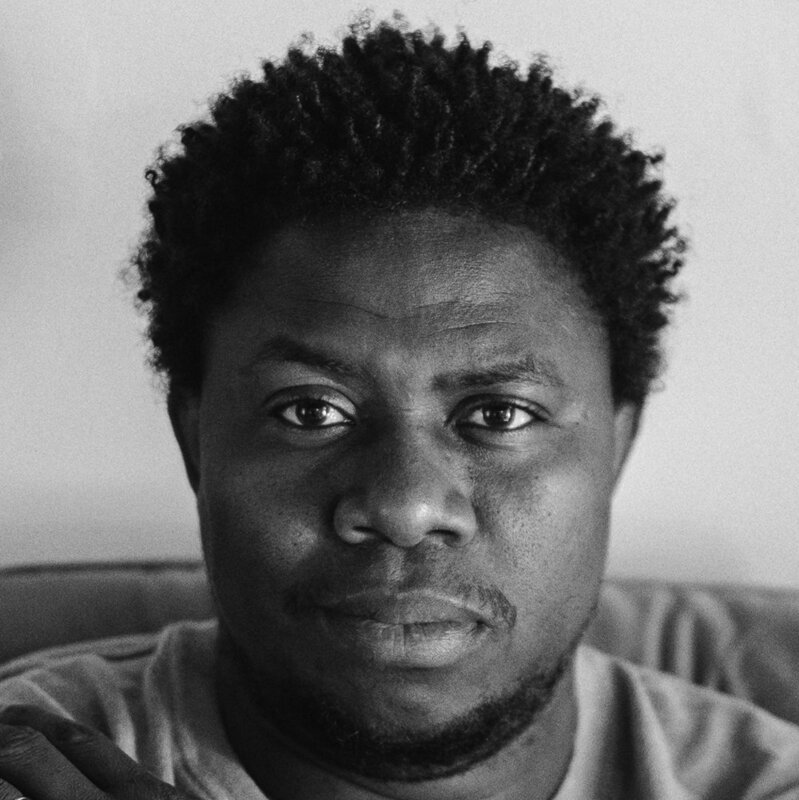 Ézé Amos is a documentary photographer and photojournalist based in Charlottesville, Virginia. Ézé is the Spring 2018 New City Arts Artist-in-Residence. His current projects include a street photography project (#cvillepeopleeveryday) and documenting local resistance actions over the past several years. His photographs of August 12 and beyond have been widely published locally and nationally. Remember will explore who and what matters in our collective memory and simultaneously open up questions about the material process of memorialization (and erasure) over time. This project features a mosaic of tiny images printed on paper and plastered onto a section of cobblestone and/or brick wall in downtown Charlottesville. The intention is to use images from everyday life in the city. We hope that an encounter with this intricate, beautiful, and unexpected mosaic-as-installation will encourage passersby to pause, investigate, inquire, and contemplate. Over time the mosaic will fade, tatter, and eventually rub away; its “audience” may also alter it. Born in Cholula, Puebla, Mexico, Federico Cuatlacuatl immigrated to Indiana in 1999 and grew up as an undocumented immigrant. Federico received his MFA in Digital Arts from Bowling Green State University in May 2015. His research concerns social, political, and cultural issues faced by Latinx undocumented immigrants in the U.S. He founded the Rasquache Artist Residency in conjunction with Sofia Quintero Art and Cultural Center and is the director of this international residency in his hometown. The focus of this project is to bring forth visibility to latinx undocumented immigrants and the issues faced by these individuals, who often feel culturally and politically homeless. Additionally, this socially engaged project aims to dismantle the current notion of tiki torches as used by neo-Nazis by reconstructing and re-contextualizing these materials into kites of protest. This project acts as an empowering platform that aims to voice concerns by building cultural agency, latinx visibility, and reclaiming political discourse. These kites will be constructed in collaboration with local communities to voice urgencies and apply relevancy to the aesthetics of the kites. Jennifer Hoyt Tidwell is a Charlottesville-based theatre and performance artist who creates within the vernaculars of vaudeville, carnival, clowning, and meditation. With magically absurd style, she navigates the interconnections between identity, gender, ecology, and grief. She is developing "The Near Misses," a performance-art band dramatizing stories of catastrophe and grace. Jennifer Hoyt Tidwell and performers Edwina Herring, Hoshin Amara Hunt, and Deandra McDonald will present the performance installation "Move Along, Nothing to See Here" on the grounds of UVA and on the downtown pedestrian mall in Charlottesville. "Move Along..." is an animatronic-style human tableau of two controversial statues in Charlottesville: Robert E. Lee and George Rogers Clark. Subversively entertaining, this "exhibit" addresses the historical invisibility of Native- and African- descended members of our community. The installation also plays with the problematic notion of "civility" as our angry and traumatized community copes with the events of August 11 & 12. April 6th / 9-1, 4-7 / 4th St.
John Freyer is an artist, author and educator based in Richmond, VA. Freyer’s practice engages accidental audiences in galleries, museums, and public spaces. Freyer is a Fulbright Scholar, a Macdowell Colony Fellow, and Artist in Residence at Light Work & the Fannon Center, Doha. Freyer has brought his social practice projects to the TEDx stage and is currently a Tate Exchange Associate at the Tate Modern in London. The Free Hot Coffee Bike is part of John Freyer’s Fifty/Fifty projects, which will be featured during the 2017-2018 Tate Exchange program at the Tate Modern. Freyer’s work offers a unique opportunity to engage people in recovery with broader publics, emphasizing creative expression as means of assisting in the recovery process and reducing the social stigma and isolation associated with individuals struggling with addiction. It also revives the simple yet meaningful practice of face-to-face dialogue ‒ a growing rarity in an increasingly technologically mediated world. Freyer’s consideration of these elements of health and wellness speaks to the interdisciplinary and socially engaged nature of his work. Leslie M. Scott-Jones is an African-American southern woman from Virginia, encompassing all that entails. She studied theater education at VCU and has been active in Community Theater for over ten years. The world premiere of her first play, Desire Moments, was part of the 2014 Capital Fringe Festival. She currently co-hosts “Home Grown,” a radio show about local art, and serves as the Artistic Director of the Charlottesville Player’s Guild. Brandon C. Lee is an African-American artist from Williamsburg, VA, where he was a slave interpreter and a member of the Fife & Drum Corps for ten years . He is a '06 UVa grad with a double major of African American History and Drama. Brandon has been active in community theater as a teacher, actor and designer from his time as a student to present day. 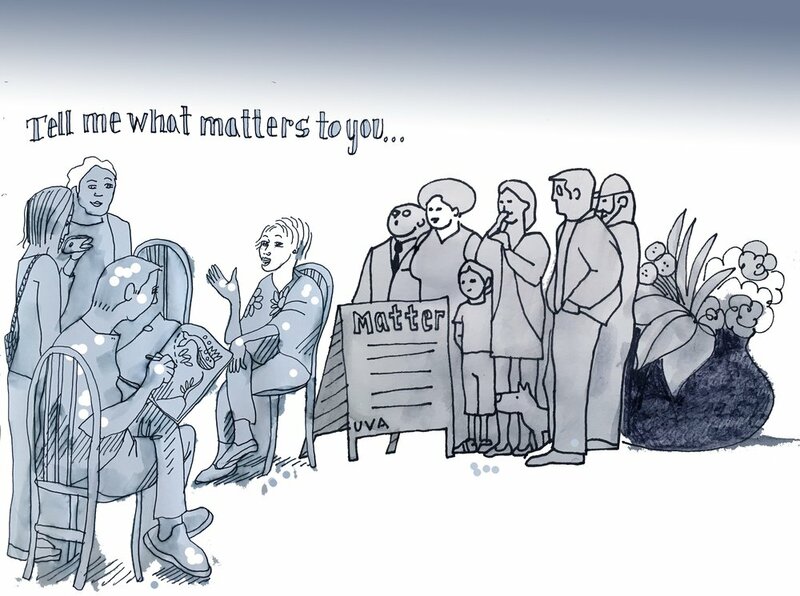 Matters is a collaboration of community artists, UVA alumni and students, professional historical interpreters, musicians and dancers to create an educational and entertaining experience. Day One features various slave interpretations and performances on grounds. On Day Two the Colonial Williamsburg Fife and Drum Alumni Corps will lead an official procession of Queen Charlotte, wife of George III, for whom Charlottesville is named, from Hospital Drive to the Jefferson School African American Heritage Center. The parade will include a horse drawn carriage, interpreters from different war eras, enslaved persons and Charlotte’s personal entourage. Montano is a performance artist who has taught performance since the 1970s and published five books. She has taught at the University for Texas Austin for seven years, the University of Ohio, San Francisco Art Institute, and the Tyler School of Art, among others. Her work focuses on “aging” in light of her condition as an aging performance artist. As an aging artist, Montano sees friends who are in nursing homes and focused on a few things: eating, sleeping and sitting all day. Montano wants to prepare herself for that future possibility; thus, she will practice being fed in public. The purpose of this is also to bring attention to the sad reality that many people have no food. The creation and consumption of food is part of a multilayered process. This project is intended to encourage people to appreciate food as a sacred matter. LuLu LoLo is an international performance artist, playwright/actor, and activist. Her ongoing performance project “Where Are the Women?” highlights the lack of public monuments honoring women in New York City and was featured in The New York Times. LuLu LoLo was a 2013 Blade of Grass Fellow in social engagement and a Lower Manhattan Cultural Council Writer in Residence (2008). 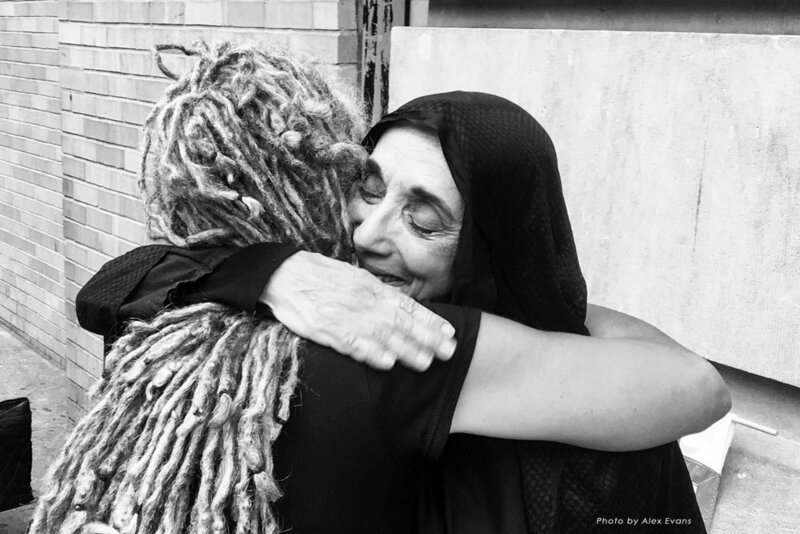 As Mother Cabrini, the Saint of the Immigrants (who sailed from Italy to New York City in 1889 to ease the suffering of the Italian immigrants), LuLu LoLo will offer blessings and compassion to passersby on her pilgrimage in Charlottesville. This consists of listening to their concerns and worries about their lives, inviting them to experience a moment of intimacy, memory, compassion, generosity, and stressing a need for social intervention in the midst of the technological cocoon we live in today. This performance honors the many immigrants in the world who leave (flee) one land for another, and highlights our country’s current crisis over immigration. Lydia Moyer is a visual artist and media maker who lives outside of Charlottesville, VA. She is an associate professor in the art department at UVA. This project draws on the belief that the sounds of crystal singing bowls can be of use in healing the physical and energetic body after trauma. Imagining the populations of UVA and Charlottesville as collective bodies that have endured recent and historical traumas, crystal singing bowls will ring out in public spaces on grounds and downtown, reaching those who pass by with their otherworldly tones. Marisa Williamson is a multimedia artist who currently teaches media art at Rutgers University’s Mason Gross School of the Arts. She has created site-specific works at and in collaboration with Mural Arts Philadelphia, Thomas Jefferson’s Monticello, Storm King Art Center, and the Metropolitan Museum of Art. She received her B.A. from Harvard University and her M.F.A. from CalArts. 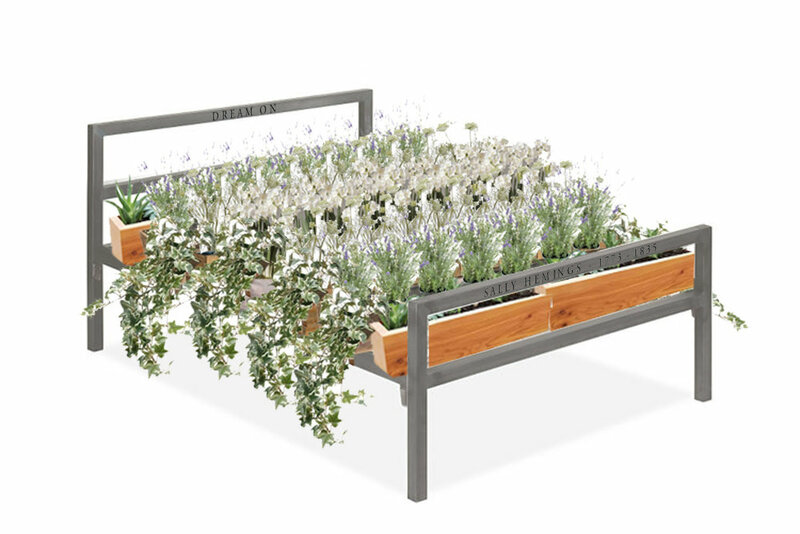 Pyre is a steel bed frame with a raised bed planter where the mattress would be. It is a public monument to the foremother, Sally Hemings. Hemings (c.1773 – 1835) was an enslaved woman of mixed race owned by Thomas Jefferson. This monument honors and recognizes her complex role in historical and contemporary consciousness. The garden will be planted and maintained collaboratively for the duration of the installation. If people choose to care for it, it should flourish. The curation and duration of this is both variable and collaborative. Ideally, the monument could find a permanent home in Charlottesville. The Big Head Brigade is an artist collective based in Virginia that makes, exhibits and performs in papier-mâché big heads. They have participated in exhibitions, performances and arts events across the world, including Zurich, Prague, Brooklyn and New York City. Megan Marlatt is the founder and director and Ed Miller is one of the group’s most prominent and active members. It is a UVA tradition to streak The Lawn, though we are unsure as to when this tradition began. We are fairly certain that it did not exist in 1826, when the young Edgar Allen Poe was a student at UVA. The Big Head Brigade will give young Poe the opportunity to fulfill this tradition by donning his big head, a naked suit* and having him streak The Lawn. 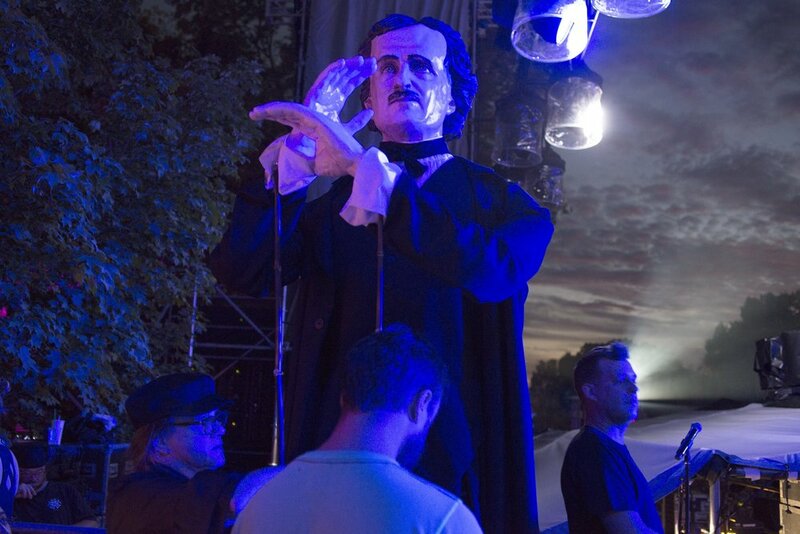 * Though the naked suit will appear as if Poe is naked, in reality, he will not be... he will not really even be Poe. Mercedes Herrero is an actress, teacher, and writer originally from Charlottesville, VA. She lived in NYC for 20 years doing plays on and off Broadway. Recent credits include: The Curious Incident of the Dog in the Night-time (Barrymore Theatre) and House of Cards. Herrero holds a B.A. in Comparative Literature from UVA and an M.F.A from the Yale School of Drama. She currently teaches at Live Arts. Mimi Halpern is a Developmental Behavioral Pediatrician. She has been an active volunteer at Live Arts and Four County Players for the past two years, enjoying her retirement. Mercedes Herrero (actor/writer) and Miriam Halpern (actor/developmental behavioral pediatrician) will interview people of Charlottesville. Based on these interviews, they will devise and perform a piece. C-vilians will be asked about their hopes, dreams, experiences, and about what matters to them: both for themselves and for the future of their town. Nina Frances Burke (b. Portsmouth, VA) attended Mary Baldwin College and has shown throughout Virginia, including exhibits at the UVA Law Library, River Fest, and at WVTF Radio (UVA Arts). Most recently, she curated All Rise: the Artist Voice in Contemporary Activism at McGuffey Art Center. Brielle DuFlon (b. Texas) graduated from UVA with a BFA in Studio Art/Printmaking. She has shown locally at The Bridge, Second Street Gallery, and the UVA Law Library as well as in Guatemala and Australia. Both artists have studios at McGuffey and were present during the August 12 events in downtown Charlottesville. These artists aim to purify the ground (as prima materia—the primordial base of all matter) of twin spaces through a dual exchange of material transmutations, interpreting alchemy as a foundation for public remediation in response to the August 2017 events in Charlottesville. The dual site-specific installations will use fiber, reclaimed materials, found objects, and organic matter from each site to create connected, interactive zones. In this intervention, cast-off or marginalized matter (be it trash/discards or people) becomes valued and renewed, forming open spaces for contemplation. The foundation for FIRST MATTER rose between these two women who were both downtown on August 12. Patty Swygert is a conceptual artist working primarily in concrete, paper, fabric, and wood. Recurrent themes in her work are numbers, statistics, social interactions, and global events. Her solo show, ADDS UP! was exhibited at Ruffstuff Gallery from September 29, 2017 through mid October of 2017. She earned a B.A. in European Studies from Coker College and an M.B.A. from Harvard University. DOES MATTER MATTER? is a textile sculpture that addresses the uniqueness, diversity, and interconnectedness of Charlottesville residents and the UVA community. 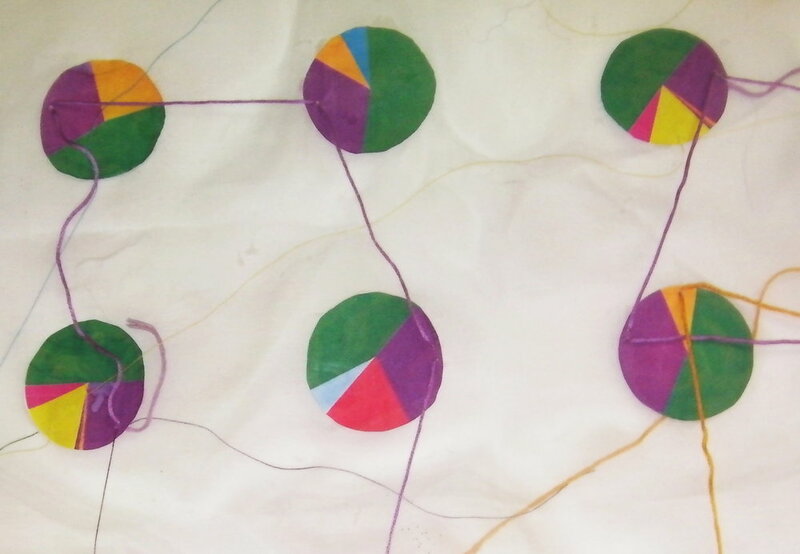 Ethnic origin pie charts derived from DNA tests and provided to the artist by members of the community will be mounted in a grid on translucent fabric panels. 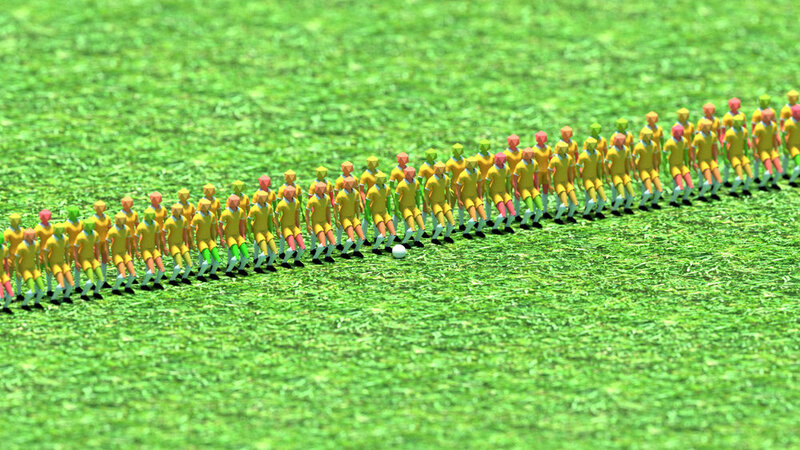 Matching color threads link the ethnic color wedge of one chart to the matching color wedge of the nearest chart, forming a web of thread over the charts. The pie charts represent the uniqueness and diversity of each community member; the web of threads represents interconnectedness. The public is invited to participate by sewing the connecting threads. Pedro Lasch is an artist, Duke professor, and FHI Social Practice Lab director. Author of four books, his solo projects include QMA, The Phillips Collection, and Creative Time, among others; group exhibitions include MoMA PS1, Hayward Gallery, MUAC, Mexico's National Palace, Prospect Triennial, Gwangju Biennial, Havana Biennial, Documenta 13 (ANDANDAND), and 56th Venice Biennale (CTS). His ART of the MOOC has had over 23,000 enrolled participants in 134 countries since it launched in late 2015. This project entails different forms of fire on the ice rink of the city’s Main Street Arena, including fire performances by Erin Riley and Joe Schepps.. Viewers may join the piece by skating, observe it from the ice rink wall, or be surprised by it from the street. Playful and solemn at the same time, the work is a celebration of the life of activist Heather Heyer. Fire and ice have been revered in many cultures as basic methods of subsistence and key elements of matter. Capturing the solid, liquid, and gas spectrum of the states of matter, their extreme temperatures also bring awe to human and planetary experience. With cool heads and warm hearts, it is necessary to reimagine fire as a positive force, opposed to the hatred that caused Heather Heyer’s tragic death. Sally Labern, director of the drawing shed, London UK, is an artist led collaborative practice. Signature mobile arts structures support participation in and co-production of multidisciplinary projects that encourage enquiring minds with critical community perspectives. Sally Labern with the drawing shed makes live interventions out on the streets, often re-purposing every day objects to recalibrate their meanings. Tanja Softić works across the media of printmaking, drawing, photography and book arts. She teaches printmaking, drawing and history and theory of printed image at the University of Richmond. She is a recipient of the Pollock-Krasner, Open Society Institute and National Endowment for the Arts grants. (Re)Vision, a large book structure (photopolymer intaglio, wax and shellac), examines losses of embodied knowledge and public space and atomization of national discourse, most notably over issues of Confederate monuments. 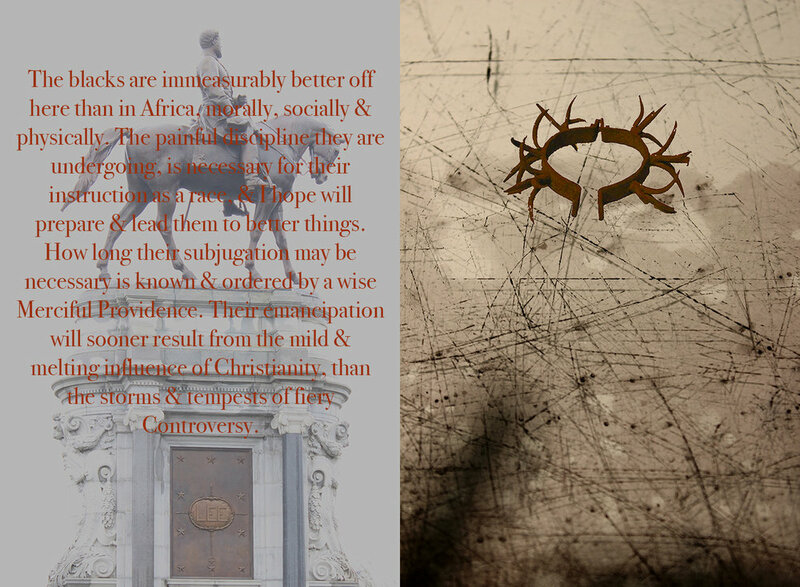 Softić hopes the viewer experiences the materiality of the (Re)Vision book and reflects on their own act of citizenship—handling, viewing and reading a book, discussing it in a public space—an act both powerful and vulnerable in an era of digitally-enabled dissolution of a shared, embodied space for political discourse. Terry S. Hardy is a multidisciplinary artist. He draws from historic events, social issues, and personal observations to make critical and artistic investigations into race, religion, sexuality, and identity. His most recent work memorializes the forgotten. His work has been exhibited throughout the US and abroad. Mandalas are historic spiritual symbols dating back to the first century. These spiritual symbols often represent the universe, unity, harmony, and healing. The Charlottesville Memorial Mandala is a sculpture created with discarded cemetery flowers collected from graveyards throughout the Southeast. The symbolism behind this mandala design is light coming from darkness. This is represented by the dark inner elements giving way to lighter elements. Hardy’s intention, with this mandala, is to shed light on the recent unrest in Charlottesville in hopes that this darkness will be extinguished by a new, more bright and inclusive union. The Bridge Progressive Arts Initiative’s mission is to bridge diverse communities through the arts. It is a dynamic and inclusive organization that serves artists and thinkers who want to share knowledge, challenge one another, and engage in the progressive expression of diverse ideas. The Bridge serves as a laboratory for understanding and responding to social issues. StoryStream is a story-listening project developed by Addie Croft that utilizes a vintage airstream trailer to engage people through the art of storytelling. This traveling airstream is utilized in order to promote conversation with people from different parts of the Charlottesville community and weave together a narrative of the diverse people that make up the city. StoryStream envisions that this “experiment in storytelling” brings a creative experience to unexpected situations and is an ongoing conversation between the members of the Charlottesville community and UVA students. Bolanle Adeboye and Wes Swing both live and work in Charlottesville, Virginia. Bolanle Adeboye is a visual artist who focuses on creating works that are interactive and collaborative. Wes Swing is an internationally touring cellist, singer and composer. In performance he uses live electronic looping and is influenced by both classical and popular music. This performance piece, a collaboration between the artist and cellist, focuses on mental health awareness by weaving together sonic tapestries, which evolve with and reflect the emotional tenor of a live audience. Will Mulany is a 24 year old artist floating somewhere in the grey area between music, sound art and new media. He is primarily involved in constructing new instruments and forging new relationships with existing instruments, but he is also interested in chance processes, inter-media composition and exploring norms in performance. Mulany prefers to work with materials that are readily accessible and cheap. This installation will address the potential of found sound in the environment through the activation of sonic objects by mechanical means. The artist has built an automated control system using Arduino and an array of power relays, as well as a smattering of electro-mechanical components like motors, speakers, buzzers, which allows for entirely hands-off activation of sonic objects. These will be placed around the installation site in ways that activate the materials of that space or the space itself. The mechanical actuators will be triggered by a centralized control system that is compositionally randomized but also responds to the presence of viewers in the space.